Principal Lauren Albani announced that LaSalle II school has been promoted to Level 1, giving the language academy more autonomy. Level 1 is the highest of three ratings levels based on growth in attendance and Illinois Standard Achievement Test scores. Top-tier schools score 28 or more points on a 39-point scale; LaSalle II earned 34 points. More information is at cps.edu/schooldata. Landscaping will begin Oct. 21 along Division and Honore streets as part of a campus re-imagination. This summer new playground equipment will be added, along with two basketball courts and a vegetable garden. The campus will be open to the community thanks to an OpenLands grant. Neal McKnight noted that developers of the former Miller Lumber property had pledged to donate to the project. This year the school at 1148 N. Wolcott has an enrollment of 622 chosen by lottery, with half of incoming students chosen from within 1 to 1½ miles of the school. Common Core testing indicates math scores in the 98 percentile and reading 85% better than schools in the same demographic range. Patrick Corcoran, a regional outreach coordinator for the governor's office, answered questions about the state insurance marketplace. The website getcoveredillinois.gov tells whether an individual qualifies for the marketplace or for social programs expanded in the Affordable Care Act. Community groups including Erie Family Health Center will be coaching people without computer access. The insurance marketplace at healthcare.gov shows deductibles, out-of-pocket expenses, copays and premiums for the private plans certified by the government, including any subsidies based on income. Plans are rated as platinum, gold, silver or bronze based on copays. Enrollment is open till March 31, and people who enroll by Dec. 15 can be covered when coverage begins Jan. 1. Small-business enrollment opens in November. CAPS beat facilitator Molly Murray and neighborhood watch coordinator Steve Niketopoulos reported on recent robbery and burglary reports. McKnight noted that police were negotiating for a beat presence at the Cook County warrant office opening at the old 13th District stationhouse, 937 W. Wood St.
EVA supports a return of sign restriction and pedestrian designation at the 1611 W. Division high-rise; Robert Schickel will follow up on 1st Ward parking and traffic-island commitments. There will be four fewer units at the former Miller Lumber site to conform to parking considerations. McKnight asked for opinions on potential bicycle and landscape improvements along Augusta Boulevard. Tom Tomek noted a 1st Ward meeting Oct. 17 regarding traffic near LaSalle II. Chicago Shakespeare Theater performed July 28 for more than 600 Eckhart Park patrons. Chicago Shakespeare Theater and Friends of Eckhart Park thanked EVA for promoting recent events; the first Eckhart Park performance for Chicago Shakespeare in the Parks attracted more than 600 people. 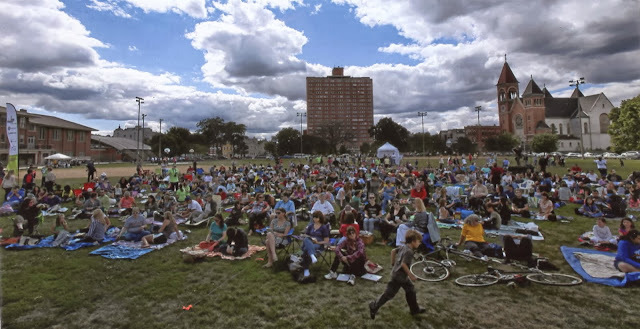 Circus in the Parks performances are this weekend in Eckhart Park, 1330 W. Chicago Ave.
Meeting opened at 7:07pm, adjourned 8:17pm at Happy Village, 1059 N. Wolcott Ave. Board attendance: Neal McKnight, Peter Locke, Gladys Anselmo, Greg Nagle, Scott Rappe, Stephen Rynkiewicz, Robert Schickel, Tom Tomek.